Winter tickets for sale from April 1st throughout the year on a first come, first served basis. Are you fishing a water with no otter protection and wondering are they still in here and how long will they last? 4200m of fencing is protecting our entire fish stocks from flooding and predation. £40k of investment. Do you push your barrow around your lake and get stuck in the mud after a bit of rain? 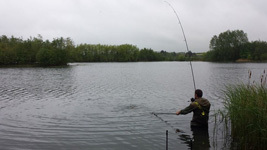 We are the only fishery in the area with stone footpaths from the entrance to every swim. £11k of investment. Does your vehicle struggle to get to the lake from the public highway? Track regularly maintained to ensure easy access and vehicle safety. £15k of investment. 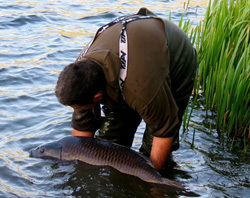 Do you have new generations of English carp from 10-35lb coming through on your lakes to replace old stock? 85% of our current stock are homegrown English strain carp. £40k of investment. Do you have to hide in the bushes to go to the toilet because your fishery will not pay for mobiloo toilets? We have 4 regularly maintained toilets that cost £1500 a year to keep clean and empty. Do you feel safe enough to leave your kit in your swim while you walk around your lake? We have no public rights of way and have erected 2000m of perimeter fencing and high entrance gates. £12k of investment. 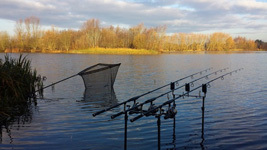 While sat fishing, do you worry about your vehicle out of sight in the car park? We have installed 24/7 car park CCTV. £2k investment. Is the weed getting out of control in your lake making the fishing tricky? Yearly lake dye treatment controls weed growth. £2.5k investment. 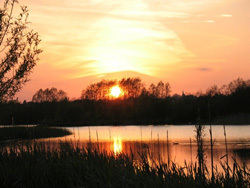 Do you get fed up of the rubbish left by other anglers and then worried by the amount of rats running around at night? Proper anglers who care about their waters don't leave any rubbish, twice yearly vermin control prevents any problems. 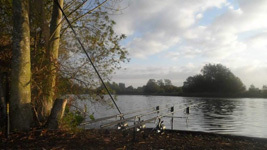 At Wellingborough Lakes you do not need to worry about any of the above because after years of investment by myself and lots of hard work from the members, we now have enough specimin fish in a safe environment in a maturing site with a good bunch of members.